(Les Sables d’Olonne, France)- “Being a serial pioneer of nautical events, eager to innovate and energize the sailing community, as well as our Vendée territory, the Sports Nautiques Sablais YC has the immense pleasure of welcoming the J/80 World Championship from the 7th to the 18th July 2018 in the home port of the 'Vendée Globe Challenge’! It is a great privilege for us to host a seventy-boat fleet crewed by more than 400 sailors, from nine nations that will be racing for five days in the bay of Les Sables d'Olonne. I am delighted and thankful to Ludovic Gilet, Chairman of the French J/80 Class. And, I would also like to thank all those who support us in this adventure: WORLD SAILING and the French Sailing Federation (FFV), our institutional and corporate partners. I cannot fail to mention the organizing committee, led by Bernard Devy, our honorary president and friend. And … let the best team win,” commented Michel Poitevineau, Commodore of SNSYC. 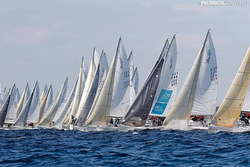 The J/80 World Championship will be an all-out battle between the top French and Spanish teams that have been at the top of the J/80 class for quite some time. In addition, there are top British and Dutch teams that are hoping to tip that balance in their favor by the end of the regatta. The nations that are represented include France (59), Spain (6), Netherlands (3), Russia (1), Belgium (2), Oman (2), Ireland (1), Portugal (1), and Great Britain (4)- missing are the top teams from the USA, Germany, and Scandinavia. Watch for these teams to be a factor in the overall regatta leaderboard. The top French crews hoping to defend their home town honors should be Simon Moriceau’s ARMEN HABITAT, Patrick Bot’s ECOLE NAVALE CG 29, Luc Nadal’s GAN’JA, Sylvain Pellisier’s INTUITIVE SAILS, and Ludovic Gilets’ FRA 797. Challenging the local French teams will be Great Britain (Nick & Annie Haigh’s SLIGHTLY STEAMY & Jon Powell’s BETTY); Spain (Inigo Jauregui’s GARATU, Rayco Tabares’ HOTEL PRINCESA YAIZA, & Javier Chacartegui’s IBO.ES); Netherland’s Otte Jan Golverdingen’s LED2LEASE; Ireland’s Patrick O’Neill on MOJO; Russia’s Alexei Semenov racing NEW TERRITORIES; and OMAN SAIL’s team of Helena Lucas. There is a very strong contingent of women skippers participating; Julie Simon’s CDV 22- IMAGO; Clara & Lucie Scheiwiller’s CLICK & BOAT- LADIES NORMANDIE; Corentin Kieffer’s CN SAINT CAST CDV 22; Maxime Rousseaux’s CN ST CAST GRAND OUEST ETIQUETTES; Elodie Bonafous’ ECOLE NAVALE CDV 29; Claire Ferchaud’s ELITE APRIL MARINE- SN SABLAIS; Elisabeth Cabus Bordron’s IFI DEVELOPMENT OUEST; Isabelle Maggiar’s LES MISSMERS DE L’OUEST; Stephanie Puyraud’s MODERN BALEINE; Anne Phelipon’s NAVIGATLANTIQUE; and Claire Montecot’s STARTIJENN. In addition, there are two “Youth Under 25” teams that include Theo Carayon’s VITEL COTES D’ARMOR SAILING TEAM and Laure Buffiere’s TEAM VENDEE. 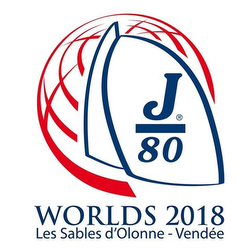 Follow the J/80 World Championships on Facebook here For more J/80 World Championship sailing information Add to Flipboard Magazine. NEW! J/99 Short-handed Offshore Speedster! Round The Island Memories- How to Win It! UK J/80 National Championships Update! J/122E JOYRIDE Eclipses Vic-Maui Race! J/Teams Win Round Ireland Race! Travemunde Week Youth SAILING Champions Debut! 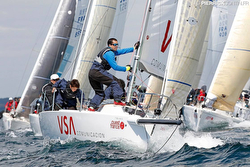 HOTEL PRINCESS YAIZA Wins 5th J/80 Worlds! RORC Morgan Cup Becomes Drift-A-Thon! Women Sailors Empowered Offshore Sailing! Dutch J/105 Leads Doublehanded Spanish Race! J/88 BLUE FLASH- Race 2 Alaska Done!